Momenta (Nasdaq: MNTA) developed the generic of the 20 milligram dosage of Copaxone, a once-a-day injectable drug by Israel-based Teva Pharmaceuticals (Nasdaq: TEVA) that generated $4.2 billion in revenue last year. The Cambridge biotech has partnered with Sandoz, the generics arm of Novartis (Nasdaq: NVS), to market it the generic under the name, Glatopa. Late yesterday, just hours after a federal appeals court cleared the final hurdle for the launch of the drug, Sandoz announced it would launch the drug priced at a cost of $173 per syringe, or $63,000 a year, compared to the current price Teva charges of $203 per syringe, or $74,000. Sandoz was solely in charge of both the pricing and the timing ot the launch of the drug. The launch means Momenta will get 50 percent of the profits from the drug, a revenue stream that will fuel development of its pipeline of biosimilar drugs and wholly-owned drugs, the most advanced of which is in mid-stage trials for the treatment of pancreatic cancer. Momenta also will get another $10 million from Sandoz as of the first commercial sale of the drug on top of the $10 million it got two months ago when the Food and Drug Administration approved it, as well as $120 million related to sales milestones. The 256-employee company's shares rose nearly 7 percent yesterday to a nine-year high yesterday after the court decision, although today it fell back 2 percent to $23.92 as of 2:30 p.m. The news comes amid fast-rising costs of the dozen or so branded drugs for MS, a neurodegenerative disease. 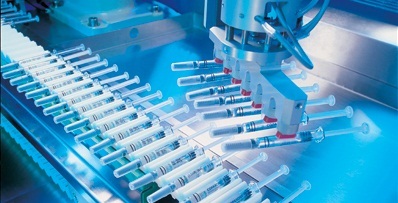 A study published two months ago in the medical journal, Neurology, found that the cost of Copaxone and two other injectable drugs approved in the 1990s, have increased at an average of 21-36 percent per year despite competition for a slew of newer drugs for the disease.